Other Observers: Glenn Walbek (at 1:40PM); I (Karen Metz) am original finder and identifier. Specific Location: across the road from 715 N. White Tail Drive (my residence) in Deerfield community of Franktown CO. South of SH 86, ca. 2 miles West of Douglas/Elbert County line; 4 miles eastof Franktown traffic light at SH86 and 83. Light: full sun; bird in shaded, treed areas; photo taken when bird in lilac shrub. Behaviors: Singing - first heard at 5:50AM, again at 7:15Am, 11:05AM when I verified visually, 1:00PM, 1:35 PM (in response to playing call tape while Glenn Walbek photographed), and a few more times in late afternoon. 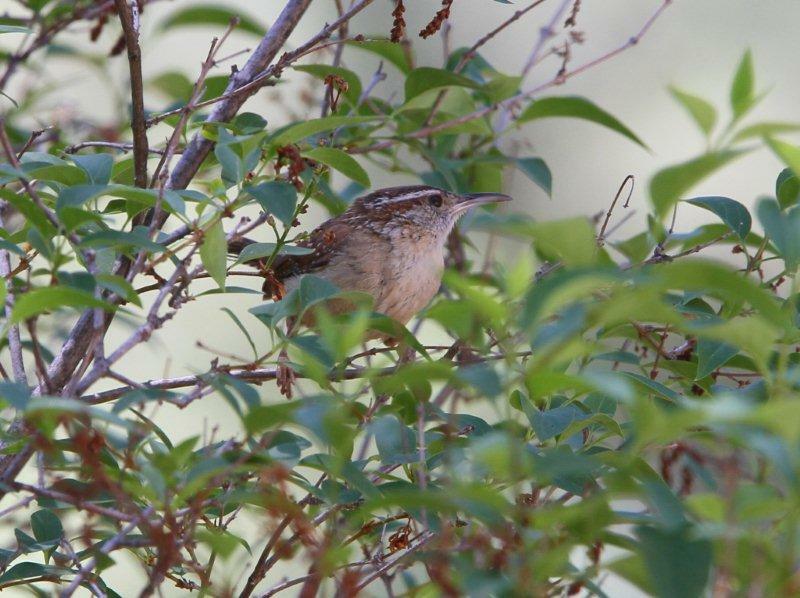 House Wren similar and common nearby hut HOWR is browner without whitish eyebrows; CARW is reddish-brown with prominent whitish eyebrows. Field guides available and consulted included Sibley, Smithsonian, National Geo; voica comparison used was iBird Pro. Comments: How do I attach the photo taken by Glenn Walbek? I do not know the exact optics that Glenn used. Independent Observers: I (Karen Metz) am original finder and identifier.